A game-changer for digital distribution? ‘How can I get my music on Spotify?’ It’s a question we often get asked, with the standard answer being that you need to go through some kind of third-party subscription service such as TuneCore or LANDR. 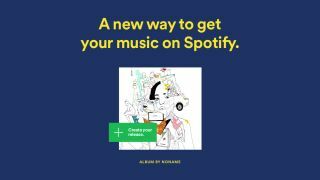 That could be about to change, though, with Spotify now making it possible to upload music directly via its Spotify for Artists programme. As things stand, this feature is only being offered in beta and by invitation to a few hundred US-based independent artists. However, the plan is to open it up to more people in the future. Using the dedicated tool, artists can preview how their releases will look on Spotify and make metadata edits after they’ve gone live, while royalty payments will be made automatically each month. Uploading is free, and there are no fees or commissions to pay. All of which sounds great, though it should go without saying that getting your music on Spotify is only a small part of the battle. Just because it’s there doesn’t mean that anyone will actually stream or download it, so while direct uploading might go a small way towards levelling the playing field for independent artists, it’ll still be hard to compete with the marketing might of the major labels. However, assuming that upload functionality is eventually (or quickly) rolled out to everyone, this has the potential to be a disruptive change, with ramifications for the likes of SoundCloud, which has traditionally been the place where unsigned artists have showcased their music. It remains to be seen whether other streaming platforms will open their gates to unsigned musicians, too. Find out more on the Spotify for Artists website.